Definitely one of the scariest horror movies in recent years. 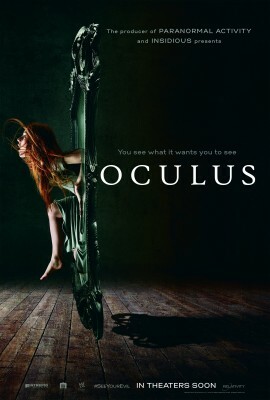 “Oculus” is the feature film from Blumhouse that is based upon a short film by the director. The plot centers in and around an ominous gilded mirror whose origin is sketchy, at best. According to legend and circumstantial evidence, it is allegedly responsible for nearly 50 deaths in approximately 400 years. Two young adults who crossed paths with the mirror 11 years prior, must face “it” again in order to destroy the mirror. Having been recently released from a mental facility, Timmy reunites with his older sister Kayleigh on a dangerous mission to send the mirror back from whence it came. The audience will be totally engrossed in this spine tingling journey into the world of the mirror and its affect upon the reflection of the mind. This movie could’ve just as easily been subtitled “Through the Looking Glass” or “Alice in Horrorland.” Unlike the recent movies such as “Insidious” or “The Conjuring,” “Oculus” does not rely upon jump scares to curdle the blood and cause the heart to race. It takes a much more Hitchcockian approach–the fear is in the mind of the audience. Hitchcock once said, “greater is the fear in the mind than the fear on the screen.” And, director Mike Flanagan has “suspense” in spades. Not that “Oculus” is without an ominous presence materializing behind a character; but the film is successful in creating legitimate fear in the minds and stomachs of the audience without having to result to cheap parlor tricks. The writers did an excellent job at blending the elements of a psychological thriller/suspense with some visceral body horror. However, there is little blood in the movie compared to many of its contemporaries. Unlike a typical horror movie, the enemy is an intimate object with molevalent powers of “perception.” Throughout the entire movie, you will ask yourself if what you are seeing is real or are you seeing what the mirror wants you to see. Are their demons in the movie? Yes AND no. This is part of what gives this movie a unique blend of horror and suspense. And yes, I am aware of which “there” I used in the previous sentence. Within the context of the movie, the demons (never mentioned directly) are both real and objects of perception in the mind of the characters based upon their troublesome past (hence, the usage of “their” earlier). You only get a glimpse of apparitions throughout the movie…and seldom a clear one until the very end. The movie plays with both perception and memory. What the audience actually sees, what the audience thinks they see, and what the mirror wants you to see. Yes, this movie engages the audience nearly as much as it engages the main characters. You are definitely along for the ride from the moment the movie opens to the close. Turn after turn, the mirror thwarts any and all attempts to destroy it. But, it needn’t even move from the wall upon which it is hung. The question of whether the mirror is actually haunted or used as a dwelling place for evil is minimally explored–though, it is definitely cleverly answered at one point. Throughout the movie, the mirror is used as a “reflection” of the human condition in a macabre allegory. Memory is a tangled web; it’s often rewritten or clouded by hidden terrors, fantasy, or that which we wish were true. We see what we are willing, programmed, or prepared to see and we are often psychologically “stuck” in certain moments from our childhood, events which we find a way to replay in a loop as our lives progress. Kayleigh has been metaphorically “trapped”, frozen in that childhood trauma until she must literally relive it. Mark Twain wrote in his book “Innocents Gone By” that we see what we want to see. It’s not so much what the mirror does to you, as much as it is a reflection of the damage we reap on our selves and others when rooted in dark and sinister fear. The mirror will have you second-guessing every move you make; and like a magician, while you are looking one way, it is screwing with your very conscious till you don’t know what is real and fantasy. Although the movie does an excellent job at developing the present and past story lines, at one point they converge; and, it does get a little confusing following the separate narratives. This could very well have been intended by the writers; but it would have been nice to have more clearly defined what time period each scene is in. Fortunately, the decor and furniture does help some to clarify this. Like Hitchcock, Flanagan knows that the greatest fear he can create in a movie is to move the fear from the screen and place it in the minds and stomachs of the audience. But, “Oculus” is not without its faults. It was shot quickly and with a minimal budget. And, that shows through in the final cut of the film. It does not benefit from the lavish sets build for big budget horror films. However, this makes what it was able to achieve even more impressive, than had it benefitted from a big budget. Unlike “Psycho,” “Oculus” will not likely linger in your mind for a long period of time, and it will likely achieve its greatest success on Netflix, or another video-on-demand equivalent in the coming months. The movie is creepy and designed to give an audience a couple hours of sinister pleasure. There are many unanswered questions following the close of the movie. And, to get into all the questions would ruin the movie for those who have not seen it. But, one main questions that an audience should ask themselves when watching a movie with a typical villain (or evil presence) is what drives them to commit the atrocities they do? There needs to be some method to the madness. Even in “Saw,” there was a reason why Jigsaw was out to kill. And, in “Silence of the Lambs,” Jamie Gum had a desire to become a woman by building a human suit. The audience in “Oculus” is left wondering why the mirror does what it does. What drives it? What will drive audiences to see this movie is what typically drives those who love to be scared. This movie will take many by surprise; because the audience is as much a part of the action, as are the characters on the screen whilst they battle the malevolent force of the looking glass. Everyone who watches this movie will take a journey, much like Alice, through the looking glass into a world of perception, reflection, and deathly memories.